Johanna Peterson working with a sixth grade art class at Northstar Middle School. 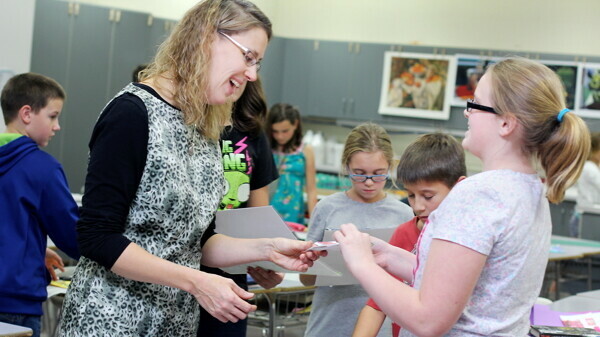 Peterson won the honor of Art Educator Of The Year from the Wisconsin Art Educators Association. Why did you want to become a teacher? Why an art teacher in particular? I come from a family of educators and I’m sure that had an influence on my choice to become a teacher. I come from a family that cares about people. My father, Bill Benson, taught art at UWEC for over thirty years. My mother, Amy Benson, has worked with special needs students, has been a Montessori teacher and has worked in a variety of other educational settings, like the Chippewa Valley Museum. As kids, my brother and I were introduced to a variety of different museums and would attend cultural events when time allowed. My husband Robert Peterson is a teacher at Memorial High School. I wanted to teach art in particular because of its natural fit with divergent thinking and systems thinking. This entails being able to “see” different solutions to one problem and being about to look at a problem using different scales and perspectives. Being able to communicate and understand information visually is part of what makes us human. Part of being an art teacher for me is connecting with students through story and experience. It just seems so exciting to learn in this manner! I also became a teacher to take on the challenge of knowing how to create enough dissonance to push students beyond their comfort level, yet knowing when to back off so students don’t become frustrated with the learning process. This is always very intriguing, as there are so many wide individual differences. Perfecting one’s teaching skills continues to be a challenge to master because each year there are new sets of variables to consider as you plan your lessons...new directives and changing goals, new students, new learning strategies and different individual needs to understand and meet. What do you think is your students’ favorite part of having you as a teacher? From my perspective, my students’ favorite part of having me as a teacher is the fact that I’m rigidly flexible. In other words, I have a set of guidelines, standards or expectations (both academic and behavioral) that I expect students to meet, but at the same I allow them the flexibility to think in a different way or a new direction to really make it their own creation. Students need to learn in a way that makes sense to them, and I get that. I would also think that my students would say that it’s not what I teach, but how I teach it that they enjoy. How did you first find out you won the award? What was your initial reaction to winning the award? In June of this year, Ann Schedivy-Tollefson who teaches art in the Cashton school district and also sits on the WAEA board as the awards chair, sent a formal letter from WAEA and also emailed me to let me know. I felt surprised, nervous at first, then humbled, then honored. Do you have a favorite teaching moment or experience? When students arrive at those euphoric “ah-ha” moments when prior knowledge connects with new knowledge in an emotional and meaningful way. I enjoy using the idea of story to help kids connect and try hard to help them make meaning through what their experiences are. What do you love about teaching/living in the Chippewa Valley area specifically? I love teaching in the Chippewa Valley because of the deep respect I have for the people who live and work here and for the feeling of support and community. From the positive impact that my previous teachers have had on me, to my co-workers (who over the years have become extended family) and to the larger Eau Claire arts community. The old saying of “it takes a village” is very true from my perspective. The support that I have been given over the years from a variety of people has been nothing short of amazing. In our free time, my husband, Robert Peterson (who teaches advanced placement psychology at Memorial) and I have engaged in many educational conversations about “best practice” in teaching. You are only as good as your support systems. I really feel that the attitudes, values and beliefs of your colleagues can affect the quality of your teaching. One of the reasons why I think the Eau Claire Area School District continues to persevere during these changing times is because of our desire to push the status-quo. As a collective group, we are always looking for ways to do things better or to improve our current teaching methodologies. I know that the citizens of Eau Claire appreciate our professionalism and are grateful for the quality educators we have here in the Chippewa Valley. I say this because I have had enough life experience to know that you don’t’ find that everywhere. I love teaching in the Chippewa Valley because here, it is the norm to go above and beyond. In my opinion this is what makes us special and unique. It is my hope that folks that don’t know that much about education in the Chippewa Valley, at least know that.